Sunol AgPark has become a thriving center for the East Bay's sustainable farming community. Sunol AgPark is the only one of its kind currently operating in the area. The East Bay has long had a passion for sustainable food systems, but the opportunities to farm large pieces of land here are few and far between. A new crop of Berkeley- and Oakland-based farmers, however, is finding opportunity at Sunol AgPark, which is run by Sustainable Agricultural Education (SAGE) on land owned by the San Francisco Public Utilities Commission. At the AgPark, farmers can lease an acre of land for $1,000 per year. Water costs a flat $500 for the year, and if tenants use less than their allotment, the unused credit can be applied to the following year. The setup is the only one of its kind currently operating in the area. Pinole Incubator Farm Project, which is located on East Bay Municipal Utility District land, has temporarily suspended its operations due to water issues. 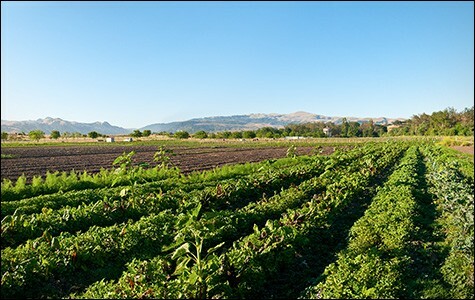 Santa Clara County's Martial Cottle Park will begin leasing land to local farmers later this year. SAGE has long supported new farmers, whose interests are informed by the needs of urban dwellers. Part of the nonprofit's mission is to conserve the agricultural land on the outer bounds of the urban Bay Area. At one time, much of the area now occupied by tract homes was used for agriculture. The eighteen-acre AgPark is in a beautiful setting, on rich floodplain soil. It's lined with trees and green hills, and is home to the bizarrely out-of-place, sixty-foot-high, beaux arts-style Water Temple. Beehives buzz at the park's outer edges. It feels worlds away from Oakland — even though it's only about a 45-minute drive from downtown. Four new farms are breaking ground this spring, joining three current tenants. Three of these are run by Oakland or Berkeley residents who have taken courses at Merritt College's landscape horticulture program, or participated in local community garden projects. "They want to make this a lifestyle, even while living in an urban environment," said farmer and AgPark manager Aspen Kvicala. One new farmer, Justin Valone of Feral Heart Farm Collective, takes BART from Oakland to Pleasanton, then bicycles the rest of the way. Members of Feral Heart Farm Collective met at the Pinole Incubator Farm Project. They chose to farm together in Sunol when that project was suspended, according to Kvicala. Food justice is at the core of the Feral Heart mission. "We are committed to making healthy food affordable and accessible," said Valone. To that end, Valone and his fellow farmers plan to provide organically grown produce to Phat Beets, a North Oakland food justice collective that runs farmers' markets and community gardens and has its own CSA. They are also seeking to partner with others who have similar goals. Another new farm, Root and Bloom, a half-acre sustainable flower and vegetable farm, is a joint project of three farmers — Oakland residents Linnea Svahn-Jaccoma, Emily Finkel, and Dartanian Kaufman — who have been very active in the sustainable food movement: Collectively, they've volunteered or worked at the 59th Street Community Garden, the People's Grocery, and Oakland Food Policy Council. Kaufman also volunteers at Acta Non Verba, an urban farm in East Oakland. Svahn-Jaccoma, Finkel, and Kaufman met at UC Santa Cruz's Center for Agroecology & Sustainable Food Systems, a well-known six-month apprenticeship program. "This is the first project that we're seeing from beginning to end, that we're doing for ourselves," said Finkel. They plan to grow sustainable flowers — like snapdragon double and double cosmos — that aren't often sold at markets because they're too fragile to transport over long distances. Another rare flower they plan to grow is the edible balloon flower, which starts out as a blue balloon and bursts open into a star-shaped flower. According to farmer Svahn-Jaccoma, people have only recently become aware of the importance of growing flowers organically, which has positive implications not only for the environment but also for worker health. The farm will sell its flowers and vegetables through a CSA, and provide flowers for events and weddings. "I love working with flowers, being in a field full of beautiful flowers," said Svahn-Jaccoma. "We'd like to bring people into that space, and bring the flowers into our communities. It just feels really powerful." Another farm just breaking ground belongs to a young couple, Matthew Sylvester and Helena Tuman. It's called Happy Acre because, as Sylvester put it, "We're really just trying to find a career that works for us, that makes us happy." Tuman and Sylvester met soon after they graduated from college, and became inspired by watching food documentaries such as Food, Inc. In 2009, they went to Hawaii looking for adventure, and ended up participating in Worldwide Opportunities on Organic Farms, an organization that connects people to farms that offer room and board in exchange for work. When they returned to Oakland, they started working in community gardens. Tuman also worked at a farm in Fairfield for three years after taking horticulture courses at Merritt. She told her classmates that by the time she was thirty, she wanted to have a farm near the Bay Area. "I was 23 [at the time], but now I'm 26. It's good to know that your dreams can be achieved," she said. The farmers at Sunol AgPark work together and help each other, with the support of SAGE. SAGE provides them with a mentor, who gives them advice on tilling and irrigating their fields. Tenants such as Kristyn Leach of Namu Farm and Fred Hempel of Baia Nicchia also help educate new farmers. "We feel like we can approach other farmers in asking what's been successful for them," said Sylvester. "The best part about it is there's a community out there." Things are just getting into full swing at the AgPark as farmers gear up their fields for summer. At Root and Bloom, some of their first flowers have just sprouted. "I feel really busy right now," said Sylvester. "But everything is starting to take off."